One might be tempted to classify this movie as "ripped from the headlines" when in fact "ripped from the trash heap" would be an infinitely more accurate assessment. 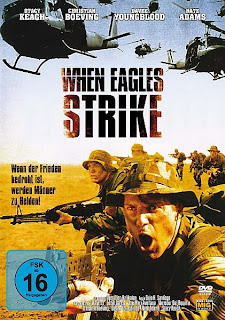 Hoping to use our current state of warfare as a hot-button issue, When Eagles Strike (also known as Operation Balikatan) is just about one of the most laughably inept war movies ever produced. 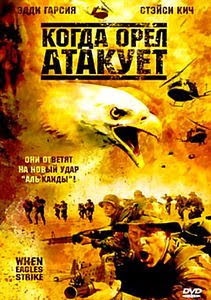 Stacy Keach (the only recognizable actor in evidence and the one who looks the most humiliated about it) leads a gang of gung-ho U.S. soldiers who have to rescue a Senator who's been taken as a POW by evil Iranians...or Iraqis. As far as this movie's concerned, they're just "evil brown people" lined up to be mowed down in an endless series of Machine Gun Moments. Words like "Al Qaeda", "Taliban" and "Bin Laden" are strewn throughout the bargain-basement banality in an effort to make the proceedings feel topical and...well, interesting. These attempts are constantly thwarted by the atrociously nonsensical dialogue, the uproariously amateurish acting performances and a meandering plot narrative that can best be described as...retarded. And shock of all shocks: the DVD comes courtesy of Roger Corman's "New Concorde" schlock-house. 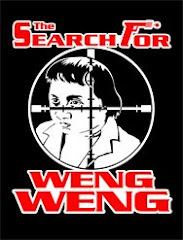 Taken as a movie worthy of the Mystery Science Theater treatment (get a few drunk, chatty friends and When Eagles Strike is a certifiable hoot) you might find something of entertainment value within. If, however, you're looking for a solid war movie, just keep on walkin'. "The film was shot on the Philippines (including Manila and Subic Bay) early in 2003, with shoots starting in February. American as well as Filipino actors were cast in the film, with ex-bodybuilder Christian Boeving taking the lead. Boeving makes his own stunts during the filming. The actor based his image in film (muscular commando) on Arnold Schwarzenegger's image from the late 80's. There was alternative edition of the interrogation-torture scene, which includes Boeving being tortured shirtlessly, longer, and with more violent manner, in tribute to cult classic action film Rambo: First Blood Part II (1985) infamous Sylvester Stallone's torture sequence. The scene was cut out of the film's final version." Can't understand why the shirtless torture scene was omitted, but Boeving does expose his glorious physique in a memorable shower scene early on in movie.